Manager of emergency cell during a crisis. 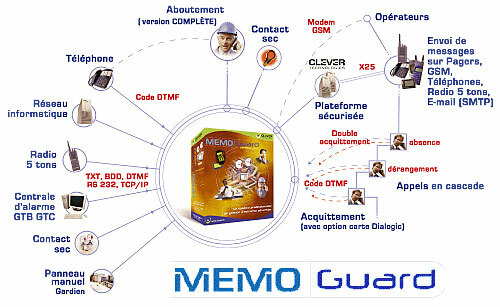 The MEMOGuard Solution allows a crisis manager . MEMOGuard has the ability to meet simultaneously all concerned manager for the emergency unit and act on the importance of the situation. MEMOGuard is an alarm and alert the supervisor who provides the ability to manage a set of options via a GUI for managing call personnel . It will allow you in a serious situation to trigger the alert and will implement the establishment of a crisis center via multiple communication channels, email, SMS, pagers, fax, voice message. The speed of sound management coordination is imperative, messages and orders to act must be transmitted regardless of the quick and safe way communication channel. This software solution allows to be responsive to emergencies. Via the software or the man-machine interface (HMI), safely, you can handle crises and alerts as well as the emergency unit with perfect coordination of actions. A journal for tracking alerts will be available to analyze the management during crisis unit to optimize this one. Traceability of actions taken will be recorded in a log with all the detailed information for each of the events. Managing a Crisis with an acknowledgment (identification and “délivrement” message) and a double acknowledgment (confirmation message by entering a code) allow the manager to close the alert, and at any time to check that was sent the alert information, who responded and acquitted and which is not yet.